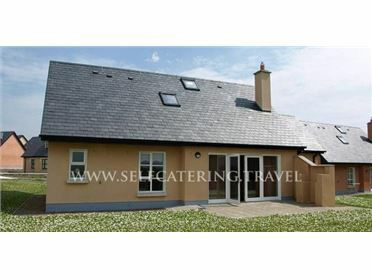 Cloonaquinn is a spacious, detached cottage set in a rural position two miles from Manorhamilton in County Leitrim. There are seven bedrooms including 3 first floor doubles (2 with en-suite shower rooms), 1 ground floor double with an en-suite shower room, 2 ground floor family rooms with 1 double and 1 single and 1 first floor family room with 1 double and 1 single, meaning that this cottage can sleep up to 17 people. The rest of the cottage includes two family bathrooms, an open plan living area with kitchen, dining area with multi-fuel stove and sitting area with open fire, as well as a second sitting room. Outside there is off road parking for 5 cars and a front patio with furniture. With walks available from the doorstep, fantastic beaches nearby plus great watersports and fishing opportunities in the surrounding lakes and rivers, Cloonaquinn offers wonderful accommodation for any large group. The cultural town of Manorhamilton lies in the north of County Leitrim, in the centre of the North Leitrim Glens, a region which is renowned for its hill walking. There is a wide choice of pubs and eateries in the town, and the area as a whole is known for its strong love of live Irish music, with many such performances taking place throughout the year. There is a theatre and arts centre called The Glens Centre. Manorhamilton Castle, now a ruin, has been transformed into an interesting visitor attraction, while other fascinating places to visit include the Leitrim Sculpture Centre and the Famine Graveyard. Visit Glencar Waterfall or take a scenic drive round the Erne Waterway. Explore the towns and villages of the area including Rosses Point, Strandhill and Bundoran and experience several golf courses, horse riding stables and lovely beaches. Manorhamilton is an ideal location for visiting the north west and beyond.